The timeless cast aluminum frame on this wood slat bench makes it a great addition to any outdoor area. The cast aluminum frame is powder-coated in your choice of the color options shown below. The back/seat planks are constructed of horizontal IPE Wood Slats that feature a dark, rich color sure to add elegance to any atmosphere. Models are available with or without end arms, as well with or without center arms. Available in 2', 4', 5', 6', and 8' lengths. 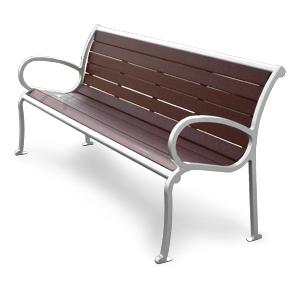 6' and 8' length benches with one center arm have one center leg; those with two center arms have two intermediate legs. Footings come standard with pre-drilled holes for easy surface mounting. 5/8" Dia. Steel Support Rod. 2-1/2" Wide Cast Aluminum Frame. 1" x 2-1/2" and 1" x 3" Horizontal Wood Slats.